Pruning is necessary to maintain or improve the health, appearance and safety of your trees. 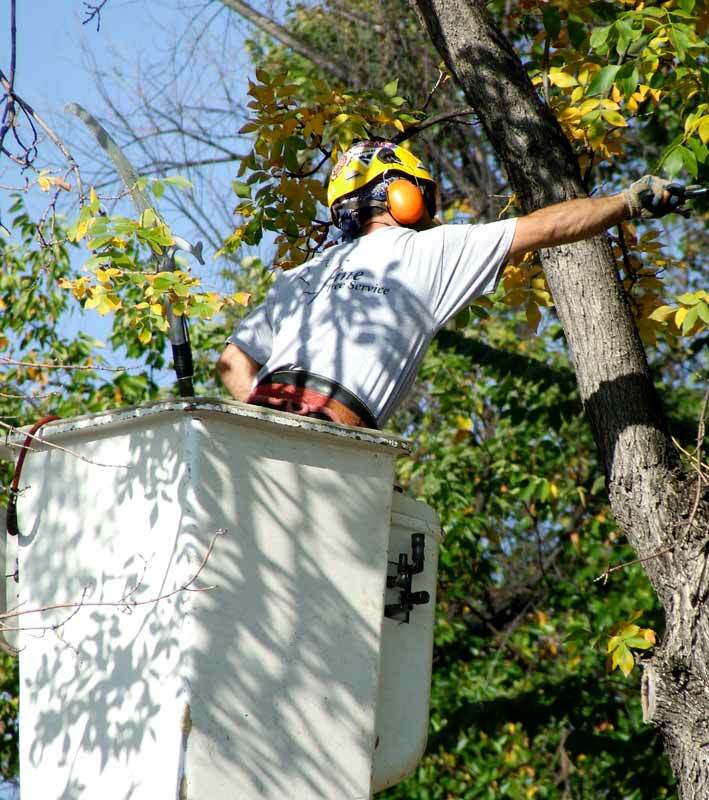 Tree pruning in Colorado is very important due to rapidly changing environmental conditions. High winds, snow loads (especially when trees are in leaf or flower) and drastic temperature swings can all lead to stress and failure in trees that aren’t properly pruned. Meanwhile, trees on a regular pruning rotation have superior structure and health. Pruning trees early in development has a profound effect on their structure and long term success. Trees grow following their genetic code. Poor pruning, storm damage, insects/diseases or environmental conditions can cause early branch removal that disrupts this genetic code and leads to altered–and most often flawed–habits. A good arborist can spot this and prune the tree to recapture its original form. This minimal investment early in a tree’s development leads to huge benefits down the road. Larger and mature trees also benefit from pruning. Structural defects can be assessed and remedied. Dead material is removed. Conflicting branches are pruned to allow for proper air flow and light penetration. Branch tips are thinned to reduce weight and chance of failure. Correct pruning improves aesthetics, increases plant health and improves the safety of large trees. All tree species and stages of maturity differ. It’s a good idea to have a pruning management plan for all trees; an arborist can play an integral role in creating and following this plan. Improper pruning can often be more damaging than no pruning at all. A well executed pruning regiment can help to ensure a tree is here and thriving for generations to come. Entire tree is pruned. Thin to reduce conflicting branches and increase light penetration/air flow. Remove deadwood and stubs 1/2 inch diameter and greater, raise as necessary.Ideal for promoting maximum tree health. Prune tree to promote proper growth form. Single leader growth is established by reducing co-dominate leaders. Remove dead 1/2 inch in diameter and greater, thin for proper air flow and light penetration. Raise as needed.Ideal for younger trees. Setting proper growth habits will decrease future problems and higher maintenance. Remove dead 1″ in diameter and larger, remove any diseased branches, old storm damage and stubs. Make repair cuts as needed.Ideal for trees with minor dead or storm damage. Also trees with health issues that do not need thinning but have dead or damaged branches. Tree is completely pruned. All dead 1 inch in diameter and larger is removed. Larger thinning cuts are made to correct form, increase light/air flow, and reduce tip weight. Raising for buildings, streets and sidewalks is done as needed.Ideal for trees that need work but have less of a budget (Rentals, etc). Removal of dead branches over 2 inch in diameter. Storm damage and structural defects are removed/assessed. Raise to proper height over walks, roads and houses.Ideal for trees where health is not a concern but safety issues exist.